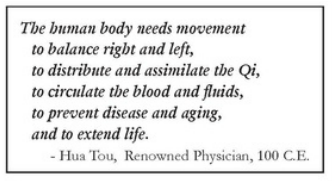 If you want to be healthy and live to 100 do qi gong. contact Blanche, 604-760-4344 or fill out the Contact Form below. Blanche has studied with a number of renowned Qi Gong Masters and has integrated her knowledge of Martial Arts, Tai Chi, Acupressure Therapy and Daoist Mysticism into her classes. Classes include lots of gentle movement with a sprinkling of theory (nothing to tax the brain), the occasional guided meditation or visualization, and some breath work. The movements are easy to learn and work on multiple levels - they leave people feeling relaxed but reinvigorated in body, mind and spirit. 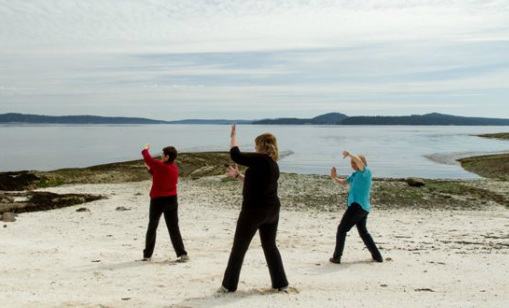 Qi Gong has a beneficial effect on our health and our longevity. Blanche is a graduate of the International Institute of Medical Qi Gong (IIMQ), California and Henan University of Traditional Chinese Medicine, Beijing, China. In addition she has advanced training in Kongjing Qigong with Master Richter and Grand Master Peng; training in Xiantianwujimen (Primordial Limitless Gate) Qigong with 19th generation lineage holder Master Eva Wong and training with Grandmaster Ken Cohen. Classes are currently taught in North Vancouver and Burnaby. Look at Upcoming Events on this Website to see which classes are currently available or fill out the Contact Form on the left to be on the Class Mailing List. by starting with small actions.